Unbeaten Tracks (Bassoon) introduces contemporary pieces of standard and new to unusual repertoire to the Intermediate bassoon player (Grade 4-7), and is paired with piano accompaniment, offering both challenge and reward in equal measure. This book, edited by John Orford, presents 7 a kaleidoscopic mix of styles by some of today's most talented composers and are undoubtedly destined to become standard repertoire. 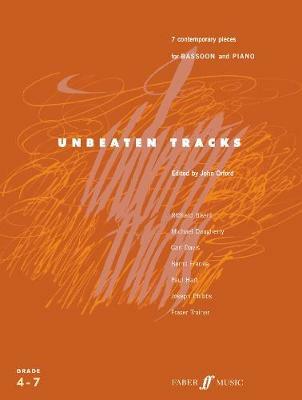 The Unbeaten Tracks Series has made a profound mark on the music world with its volumes of specially commissioned pieces for Intermediate-level players. There are also small 'biopics' about each composer that give tidbits of information about the composer's inspiration and intention behind their piece, which give musicians a greater insight into the music.